In January, I led a UD study abroad program in Brazil. I took fourteen students and a TA to the Amazon for a week and then to Rio de Janeiro for the remaining two and a half weeks of January. 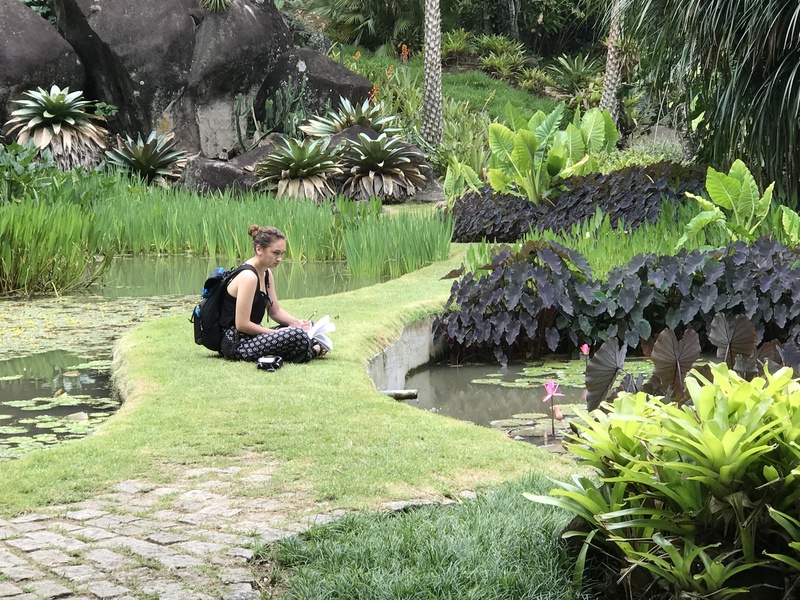 It was a great opportunity to learn about environmental issues in Brazil and the wonderful gardens of Roberto Burle Marx and other great Brazilian landscape architects. 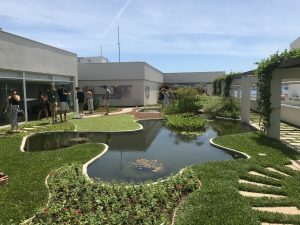 The fourteen students came from all over the University, but several were landscape architecture and wildlife conservation majors from the College of Agriculture and Natural Resources. Most of the remaining students were environmental studies majors or science majors with concern for the environment. Our first stop at Uacari Lodge was in the Mamiraua Reserve about one hour via motor boat from the town of Tefe on the Amazon River (or Solimoes at that location). The Reserve showed students a wonderful community model. Two naturalists, as well as local guides and support employees who rotated from the communities within the reserve staffed the floating lodge. Ecotourism dollars from the lodge provided employment for local community members and proceeds were used to buy items like a new motor so the community boat could reach a city hospital more quickly in emergencies. Students loved seeing plants and animals of the Amazon, especially, pink river dolphins (botos) and caiman swimming near our lodge. We discussed the importance of saving the Amazon ecosystem and all the valuable plants and animals that reside there, but also how important it is to allow native peoples to make a living and prosper. 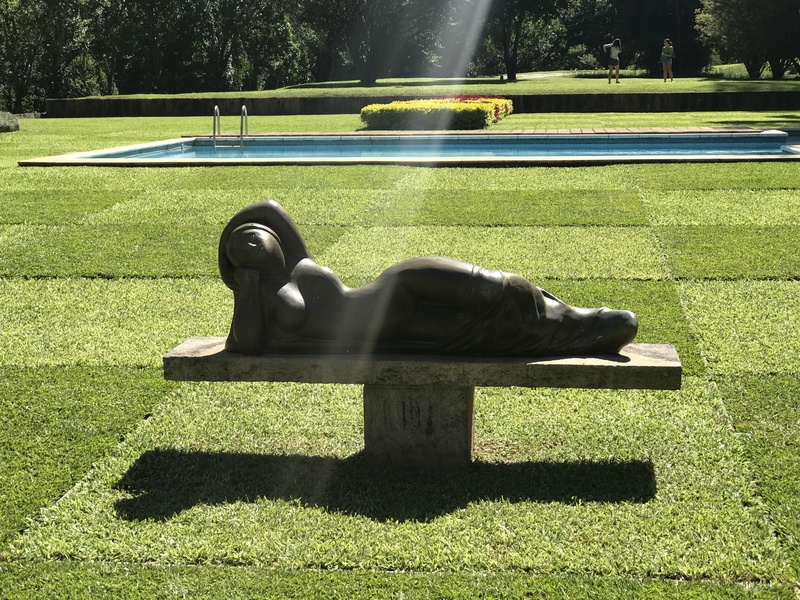 In Rio de Janeiro, we had the opportunity to visit several gardens designed by Roberto Burle Marx, including his home or sitio, which includes acres of spectacular tropical plantings and several fascinating buildings reconstructed on site. Burle Marx is the landscape architect credited with beginning the native plant movement in landscape architecture. He spent several teenage years in Germany and became enamored with the tropical plants he found in hothouses in the 30’s. 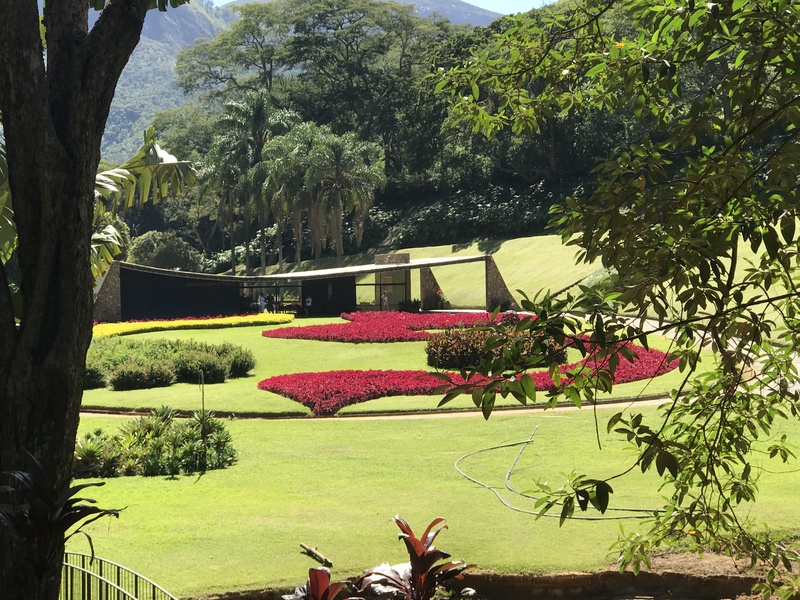 When he returned to Brazil, he realized those plants were Brazilian native species and began to create colorful mosaic landscape designs with those tropical plants. 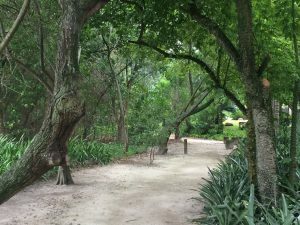 Burle Marx used those native plants, not in naturalistic designs, but in painterly sweeps that create artwork on the landscape. We visited Tacaruna just north of Petropolis. 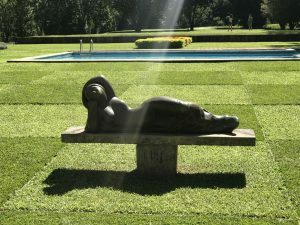 This garden includes broad sweeps of colorful plants (the flowing “female” side of the landscape) and a checkerboard of different grass species (the orderly “male” side of the landscape). 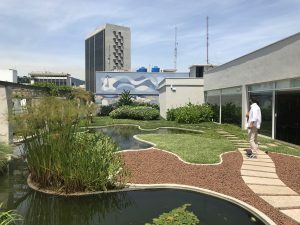 The roof garden on the Brazilian Re-Insurance Institute (Instituto de Resseguros do Brasil “IRB”) was recently renovated by BurleMarx, Escritorio de Paisagismo, the landscape firm owned by Burle Marx and his partner Haruyoshi Ono, now run by Isabela Ono. Burle Marx brought gardens to the tops of buildings long before it became fashionable throughout the world. 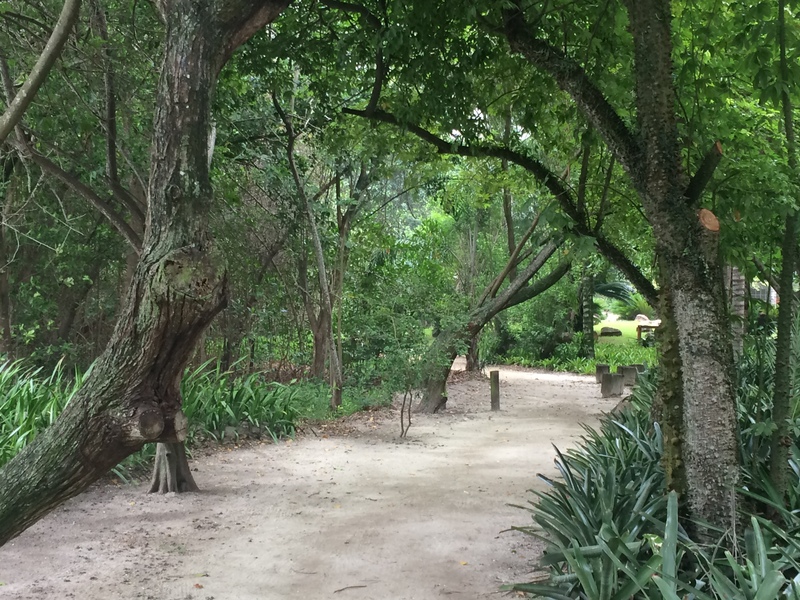 We also visited Inhotim, a public garden featuring modern art in galleries and landscape settings. 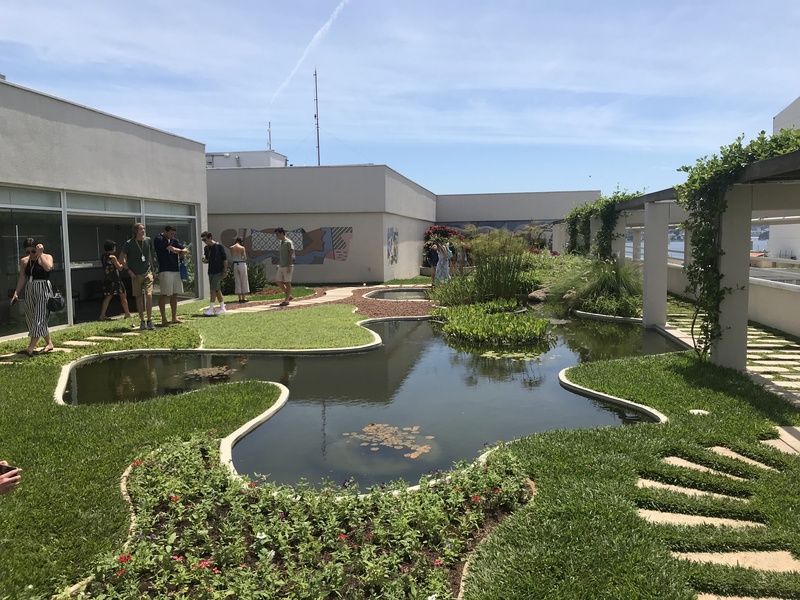 Art from many of the Brazilian artists (Helio Oiticica, Clido Meireles, Vik Muniz and more) students researched for a study abroad presentation was displayed throughout the garden. Students said “It was fun to see “my” artist’s work in a garden setting”. Penisula is a development in Barra da Tijuca built on highly disturbed land surrouding an inland lake. It was designed by Fernando Chacel and includes three important zones – mangrove swamps to cleanse the water provide biodiversity; restinga zone to protect the mangroves; and the park zone providing spaces for people to enjoy. This reconstruction was made possible through Brazilian laws requiring re-establishment of mangroves around bodies of water prior to development. Students also enjoyed the wonderful people and culture of Brazil. If you want to learn more about this program, visit the student blog (http://sites.udel.edu/explorebrazil/). For more information about Study Abroad programs at UD, visit http://www1.udel.edu/global/studyabroad/. 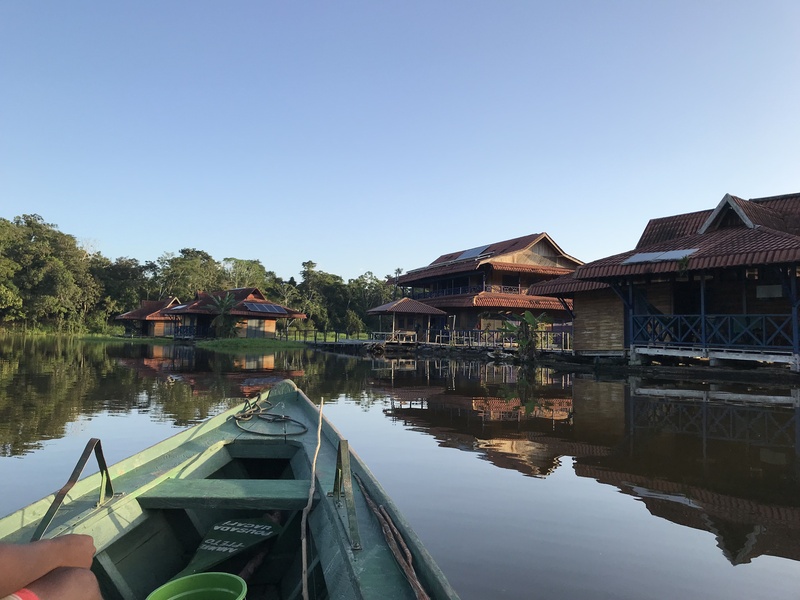 Floating lodge in Mamiraua Reserve on the Amazon. Restinga planting between mangrove swamp and park at Peninsula development. 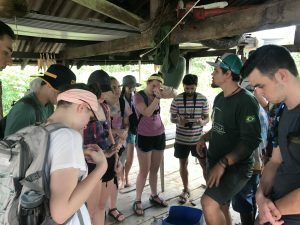 Students learning about the turtle rescue project from a local guide. Relaxing on the boat after a forest excursion. Student, Cate Medlock, sketching in Roberto Burle Marx’s garden. The roof garden on the Brazilian Re-Insurance Institute (Instituto de Resseguros do Brasil “IRB”) was recently renovated by BurleMarx, Escritorio de Paisagismo. Students exploring the rooftop garden. Sweeps of colorful annuals at Burle Marx designed, Tacaruna. The checkerboard pattern is made with two different species of grass. 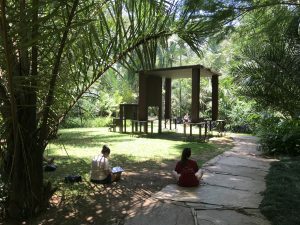 Students sketching a cool outdoor sculpture at Inhotim. The current extinction rate is possibly 100 times great than normal and humans are definitely responsible. So what are we doing about it? 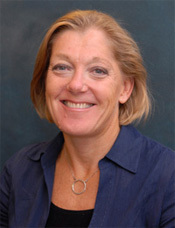 Stephanie Hansen, a Delaware State Senator got the state senate to convene a task force to address this issue in Delaware. 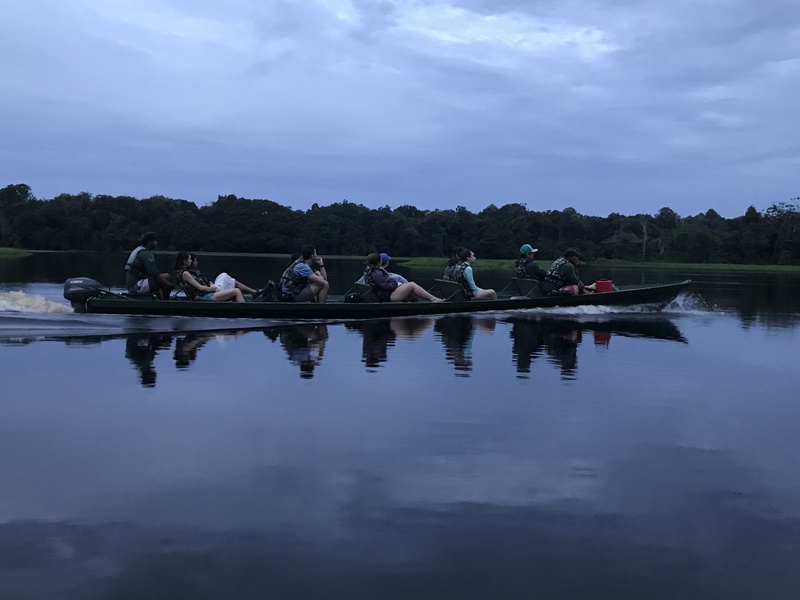 The Task Force began in July with a presentation from UD’s Doug Tallamy, author of Bringing Nature Home and The Living Landscape, both books that address the loss of species diversity and possible solutions. The Task Force submitted recommendations to the Governor, President Pro Tempore of the Senate and Speaker of the House on December 1, 2017. 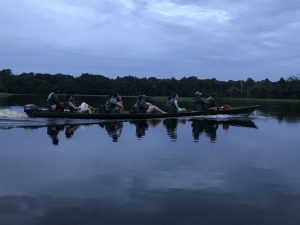 There were 19 members representing a wide variety of stakeholders including state senators and representatives, County administrators, DNREC, DDA, Delaware Association of Realtors, DE Farm Bureau, Chamber of Commerce, Home Builders Association and a number of environmental organizations on the Task Force. I represented the Delaware Nursery and Landscape Association. Education – The public has an important role in the prevention of extinction of local species and education is key to understanding. Incentivize Private Landowners – Incentives taking the form of money, public recognition and ease of permitting encourage the removal of invasive species and their replacement with native species as well as the replacement of non-native species with native species. Government Leads by Example – Government facilities should be landscaped and managed with native species. Legislation Affecting Development – Policy changes may be necessary at the state and local level. Funding Open Space Program at Statutory Level – The Open Space Program provides opportunities to stem the loss of native species. Legislation to Prohibit the Sale of Invasive Species – The sale of invasive species is an important factor contributing to the loss of native species in Delaware. Deer Management – The proliferation of deer is an important factor contributing to the loss of native species in Delaware. Education is by far the highest priority, with 22 individual recommendations including developing curricula for school children; promoting demonstration gardens; providing public presentation; encouraging landscape contractors to remove, manage and control invasive plants and replant with native species; and promoting the Delaware Livable Lawns Program. There are recommendations to create incentives for reducing lawn area and replacing it with native plants. Pollinator and other insect habitat gardens are encouraged. All Delaware state facilities should set the example by reducing lawn and replacing it with native or pollinator plants and revising land management practices to be more pollinator friendly. DelDOT should take the opportunity for roadside right of way to provide habitat and reduce mowing. A significant recommendation is to make the sale of invasive plants illegal in Delaware with an appropriate phase-out period, Invasive plants are defined as those on the Delaware Invasive Species Council plant list, which must be reviewed and amended. The final recommendation is the formation of a Delaware Native Species Commission by the General Assembly to implement the 78 recommendations of the Task Force and report back to the General Assembly. While there is a long way to go before implementation, this is good news for Delawareans and especially the nursery and landscape industry. By moving away from mowed lawn, we create opportunities for the nursery and landscape professionals. Anyone can ride on the back of a lawn mower, but skilled professionals will be required to plant and manage landscapes. Industry members have called for a “leveling of the playing field” for a while now when it comes to a few key invasive plants still bought and sold in the trade. Once they are illegal to sell, we will be in step with other Northeastern states who are reducing the introduction of these plants that destroy natural areas. I hope Delaware’s legislature takes the Task Force recommendations seriously and starts the implementation process to save Delaware’s remaining wildlife and all the ecosystem services it provides to us, like clean water, clean air, wildlife habitat and much-needed human engagement in the landscape. 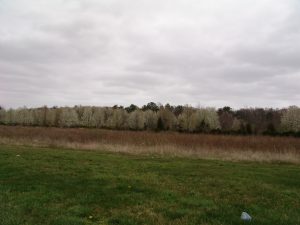 Callery pears are one of the species that might be banned from sale in Delaware. This tree has choked our roadsides and while it has attractive white flowers, it supports no native insects and chokes out important native species like serviceberry and black gum that should be populating Delaware’s forest edges. I recently had a meeting with Tom Zaleski and Joe Spadafino to talk about meadow management in Newark parks. They are doing a great job of allowing some areas to become meadows and even letting a few park areas, where appropriate, return to forest. During the meeting, I found out about an exciting new proposed park. The site of the Rodney dorm complex is slated to be sold to the City of Newark, if a referendum passes next April. If you live in the City of Newark, you will have an opportunity to vote on this referendum. The plans included tearing down the existing Rodney dormitories. Then as early as 2019, construction will start on a new park. 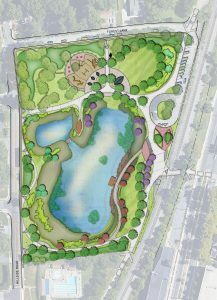 The park includes a large pond designed to handle significant storm water from several Newark neighborhoods with flooding problems. 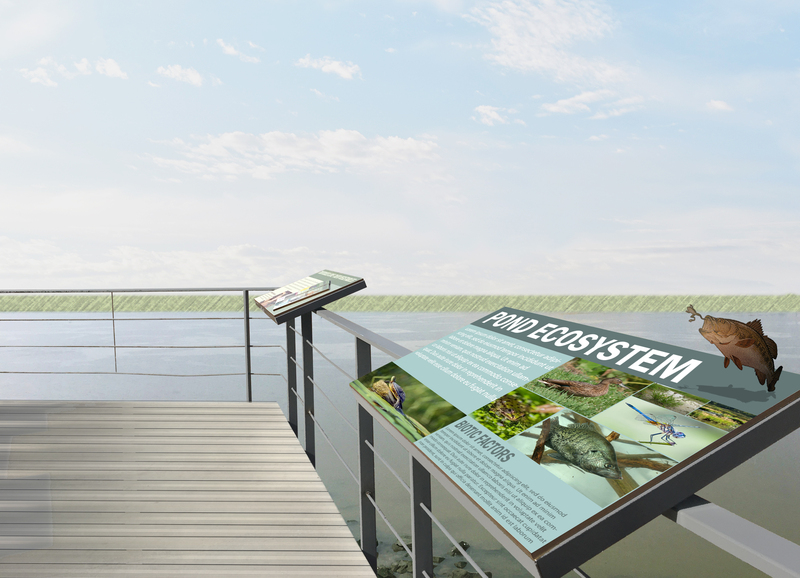 It will also have a fishing pier and observation deck. Wetlands will be planted along pond edges and a rain garden handles water at the northeast end of the park. 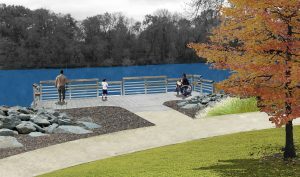 Several floating wetlands are included to help with water quality. I am excited to see the floating wetlands used in a pond. I have seen them proposed on projects, but never implemented. When Gary Smith included small floating wetlands in a project at the New England Wildflower Center, a female duck took up residence on one island and comes back every year to raise a new brood—so fun for staff and visitors to watch! The proposed park will include some lawn areas but it will also include woodlands and meadows. There are plans to naturalize bulbs in the meadow and provide a walking trail through the meadow to a natural play area with seating and small pavilions. The play area will encourage creative play. It will not be your typical playground with swings and a sliding board. There is even an outdoor classroom with amphitheater seating in another section of the park. Parking areas will be available for cars and bikes and there are plenty of trails providing access throughout. This is just the type of resource Newark needs to get kids outdoors and allow everyone to interact with natural areas and planned garden spaces. Most importantly, get out and vote next April, so you can have a say in the resources available to you in Newark.